A soft but highly durable form factor is the main feature of the Quick Stow. Aside from a massive update of bladders and hydration packs, CamelBak showed us how busy the R&D lab has been with a whole new array of bottles.v Podium water bottles and some cool pre/post ride beverage options from their Lifestyle collection like the Chute, Eddy and KickBak. 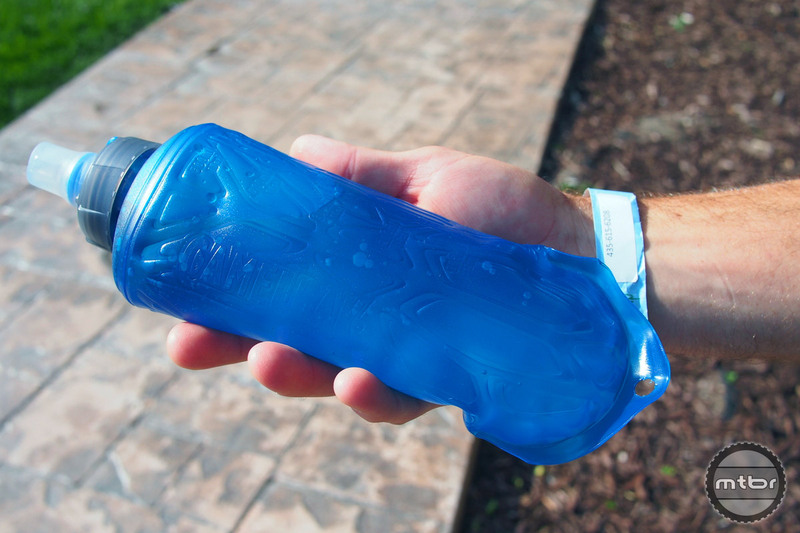 Originally developed for the running category, the all new Quick Stow is a collapsible soft flask that comes in a standard and insulated (Ice) version. It has a more sturdy design than other collapsible flasks on the market for easier gripping. This design also makes it easy to stash in a jersey pocket. The Quick Stow holds .5 liters of fluid and the threaded cap sports CamelBak’s Jet Valve. These will be available in October of this year and the price is $20 for the standard Quick Stow and $28 for the Quick Stow Ice. Podium bottles in different sizes and colors. For 2017, CamelBak updates the popular Podium and Podium Chill water bottles with new colorways like the All Black that was a popular request, believe it or not. 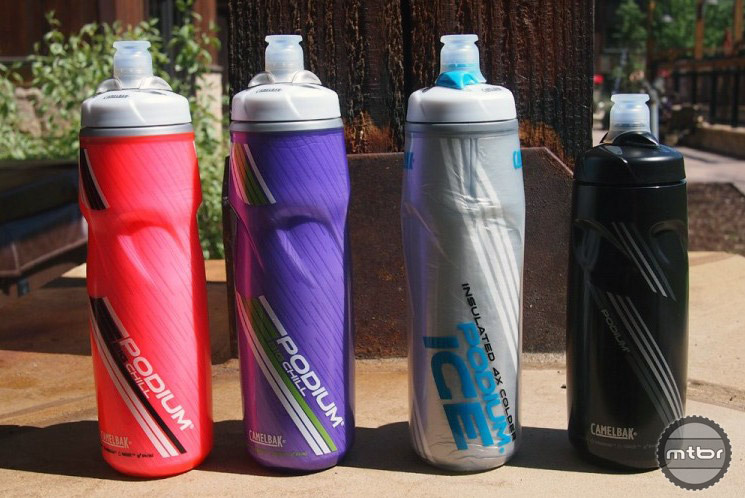 Ice version keeps things 4x colder than the standard Podium bottle and uses CamelBak’s Aerogel insulation. Otherwise, the bottles keep the same features like the Jet Valve top, removable nozzle for easy cleaning, 100% BPA free and positive lock for leakproof transportation. Shown here are just a few of the many new graphics designed to hit the market in January of 2017. 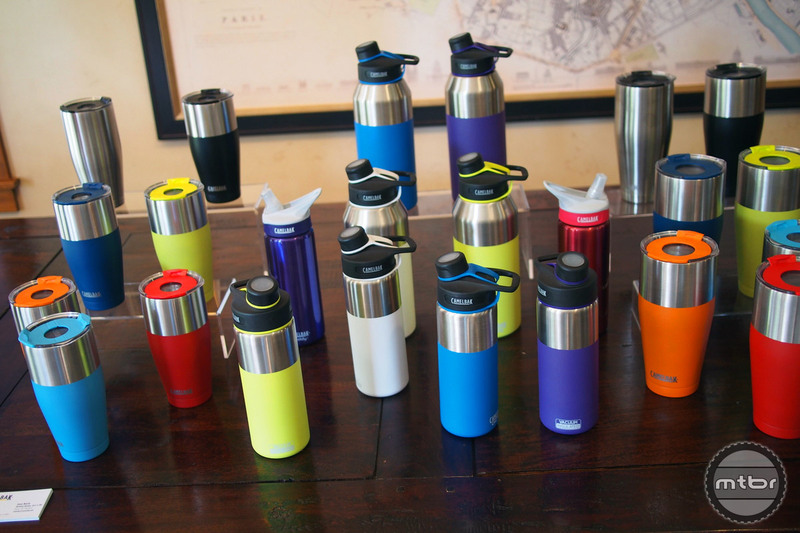 Vacuum insulated bottles are available in many options. 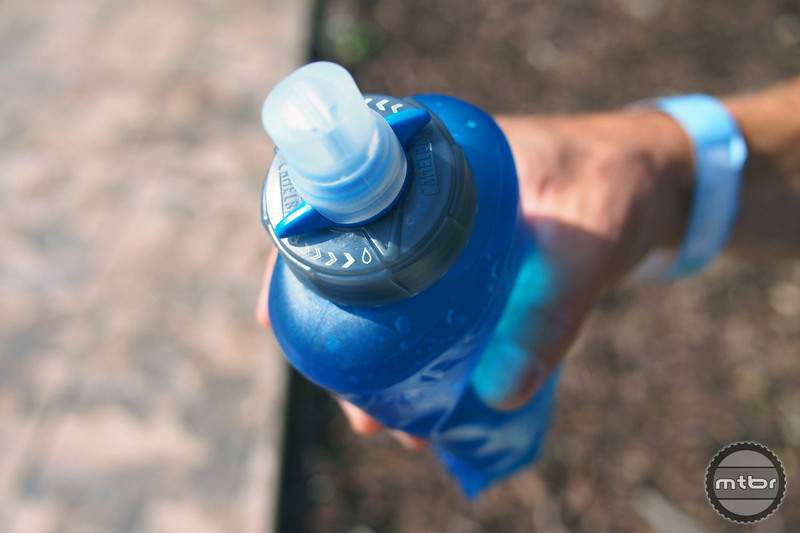 For your pre-ride or post-ride beverages, CamelBak has developed some new products from their Lifestyle collection. 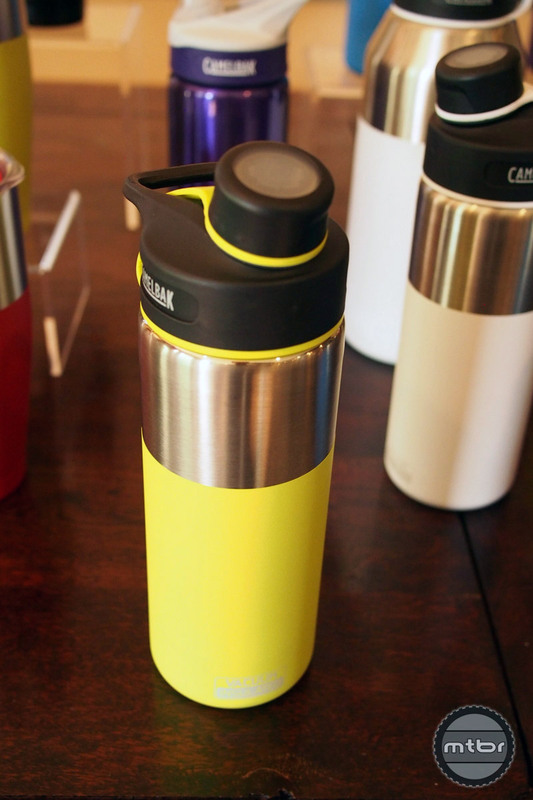 Highlighted here is the Chute, which is a vacuum insulated stainless steel bottle that comes in 20 or 40 ounce sizes. The Chute can keep your fluids cold for 48 hours or hot for 6 hours. 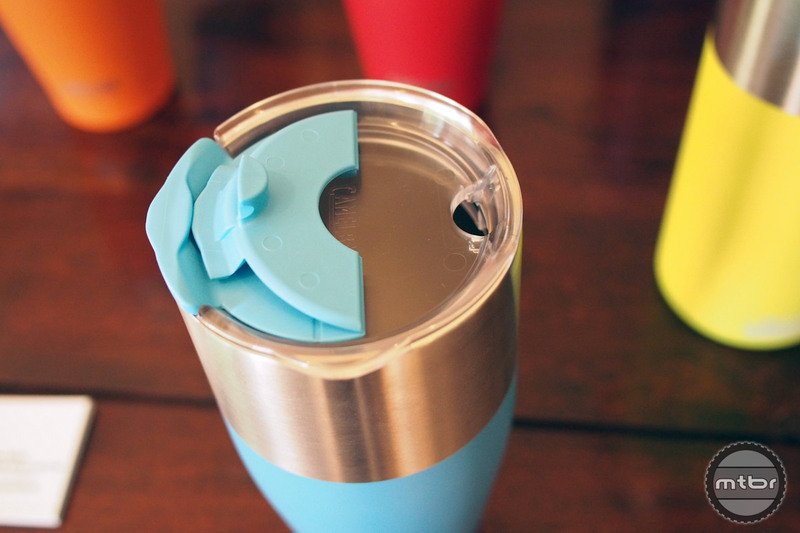 There is also a stowable threaded cap for ease of drinking. The bottle is made of 18/8 stainless steel and is BPA/BPS/BPF free. The Chute is available now and the suggested price is $28 (20 ounce) and $38 (40 ounce). KickBak pour mode (left). KickBak sip mode with the smart cover (right). The KickBak Stainless Travel Mug (20 oz. $29, 30 oz. for $37) will begin shipping in Jan 2017. The KickBak models have hinged lids that is splash-proof. 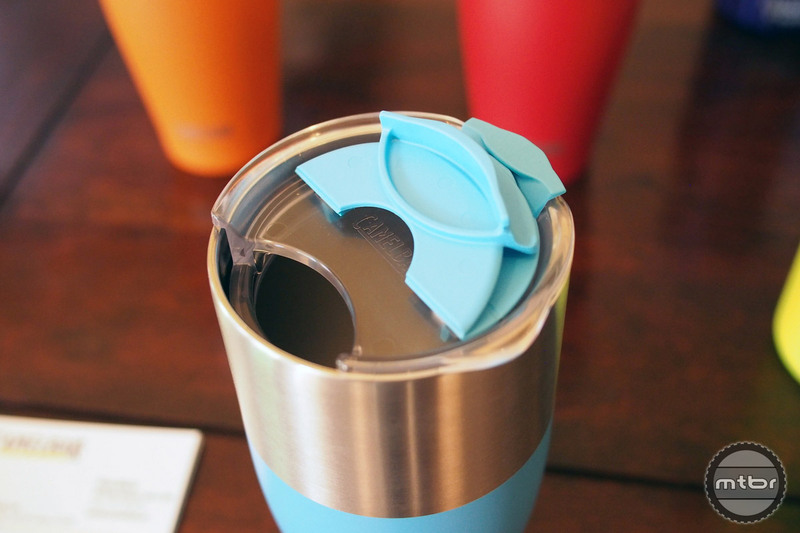 The smart lid has a pour mode and sip mode on opposite sides of the lid. For more information visit www.camelbak.com. The head is still full featured for convenient opening and closing. Vacuum insulated bottles are here to rid us of those incredibly wasteful disposable water bottles. I use the Podium Chill in the winter to keep my water from freezing. Through it in the frame bag and it will keep water in liquid form for hours, even at below zero temps. Podium Chill is no match for winter (and longer rides). The water will eventually turn into slushy and – worse – the valve will freeze rendering the content inaccessible. I may try this new option next winter season. Also, this may help to keep the valve clean in muddy conditions when – again – the content of the bottle mounted on the frame is virtually inaccessible.